Our journey toward 3D-printed magnetic soft materials started from a simple question: “What if we can make a soft robot that can be remotely actuated and controlled by a clinical MRI scanner?”. Our group, Soft Active Materials Lab at MIT, have been interested in soft robots and actuators because of their potentials in biomedical applications. Soft materials, owing to their inherent softness, are more favorable to human bodies and hence more suitable for biomedical applications than their rigid counterparts. We thought, however, that current soft robots are often heavily tethered because they need to be pneumatically actuated and thus practically limited for biomedical applications. We thought soft active materials could be a solution. Soft active materials refer to soft materials, such as elastomers and hydrogels, responsive to external stimuli such as heat, light, solvent, electric and magnetic fields, by which one can obtain desired shapes in a programmable manner. The most common examples include dielectric elastomers, shape memory polymers, and liquid crystal elastomers. Despite many expectations, however, these materials have been often too slow or require too high temperature or voltage to be practically useful in biomedical applications. These limitations of existing soft robots and active materials brought us this idea of magnetically actuated, thus untethered, soft robots that carry out tasks in a remotely controllable manner. Other groups have fabricated magnetically responsive soft materials, but their shape changes have been limited to simple bending or elongation. Bringing our attention to the point that ‘shape determines functions’, we reasoned that increasing the level of complexity in terms of achievable shapes would be required for magnetic soft materials to be functionally useful. It also seemed that the increased complexity and thus more sophisticated functions are necessary for developing such magnetically controlled soft robots. Our next question was: “How can we create magnetic soft materials capable of complex shape changes?”. 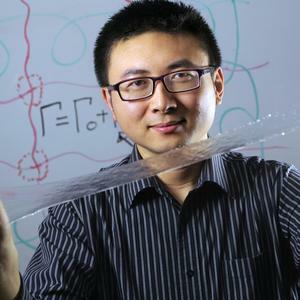 The state-of-the-art technique to create magnetically responsive materials was first deforming a cured elastomer containing magnetizable particles into a particular temporary shape and then applying a strong magnetic field to magnetize the particles. This procedure creates a non-uniform magnetization pattern inside the elastomer. The elastomer is then released to revert to its original shape. Owing to such patterned magnetization, the elastomer tries to deform into the previous temporary shape when an external magnetic field is applied. The major drawback of this method is that the achievable shapes are limited to simple geometries such as one-dimensional beam-like structures. Moreover, there often exists a gap between the desired shape and the actual shape obtained upon magnetic actuation, which makes it difficult to precisely design and control shapes particularly when the geometry becomes complicated. We thought, ‘What if we can directly inscribe magnetic polarities in soft materials to form intricate patterns of magnetic domains to create complex 3D structures?’. This was the beginning of our idea of printing ferromagnetic domains in soft materials. We came up with a simple idea of applying magnetic fields while printing elastomer fibers containing magnetic particles to reorient those embedded particles along the applied field direction. To see whether the idea works, we printed a single fiber while applying magnetic fields around the nozzle. After curing, the fiber showed a clear magnetic polarity, acting as a permanent magnet flexible enough to easily bend along the external magnetic field. We were excited by this result because it meant the capability of designing intricate patterns of magnetic domains in our printed structures, thereby creating magnetically activated, complex shape-shifting behaviors from such 3D-printed soft materials. A variety of interesting shape-morphing structures including remotely controlled 3D mechanical metamaterials and a reconfigurable soft electronic device are presented in our paper. We also present a theoretical model that allows us to quantitatively predict the behavior of our printed magnetic shape shifters. We further show that several functions could be derived from programmed shape changes, which enables our printed structures capable of performing multiple tasks. One example is what we call the MIT spiderlike grabber. Depending on the applied field strength and direction, this magnetic soft robot can crawl, roll over, carry a drug cargo, and even catch and release a fast-moving ball. These demonstrations prove that our shape-morphing structures are strong and agile enough to interact with fast-moving objects. We are expecting that our technology will allow us to develop untethered magnetic soft robots capable of operating in confined and enclosed spaces, like the human body, for future biomedical applications. To this end, we will need to further expand our materials and fabrication platform while advancing the actuation field control for such magnetic soft robots.